Political history; and winner, in 1989, of theBancroft Prize, the Francis Parkman Prize, the Los Angeles Times Book Award, the Avery O. Craven Prize, and the Lionel Trilling Prize. I thought this book might be rather dry but I’ve always been interested in exactly what happened (and what didn’t) during the Post Civil War Reconstruction. There are a few draggy chapters but overall I’m enjoying it quite a lot. 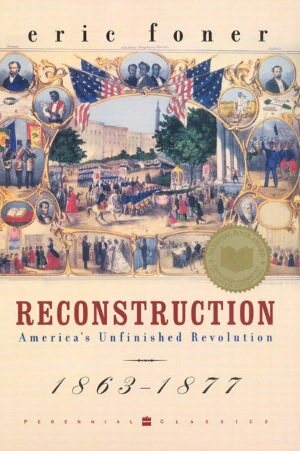 In the Preface Foner states that he believes that Reconstruction started with the Emancipation Proclamation so that’s where he starts. Chapter 1 concerns the world at the time of the Civil War – antebellum South, industrializing North, expanding West, powerful East. The animosities and fears, the extremists and the moderates, the Californians. Chapter 2 is more about the politics of the war and when they knew they were going to win, what did the North do, did they make any preparations? They did work with the border states. And when the war was over what was the first response in the South? Among whites? Among blacks? What about the 13th Amendment which guaranteed Blacks the right to vote? Where did the idea of “40 acres and a mule” come from? Just because slavery was gone didn’t mean the problems were. Chapter 3 -” The Meaning of Freedom” now and it’s the best chapter yet – this one deals with the blacks as they set up families and churches and schools and tried to vote and farm and work in the year or two directly following the Civil War. 4 – Ambiguities of Free Labor – White planation owners had been accustomed to to extremely cheap labor. For the cost of minimal food, clothing and shelter they got 16 hour days probably 6 days a week and then they could sell the property. Now the freedmen wanted to work for themselves on land they owned. I am just amazed at how many ideas there were for “Reconstructing” the demolished South. Bottom line, in this agrarian society, “land was the foundation of freedom” and that’s what everyone wanted. Many freedmen got land and it was taken away – back to the plantation men. But blacks wouldn’t work willingly for their old masters – so they were “convinced” – sometimes with extreme brutality – that it was the “right” thing to do. They could only be paid after their “contract” had ended. Share wages started. Black work gangs started. Fines for any black man without a contract for work. 5. “The Failure of Presidential Reconstruction” Johnson was a strange man – stubborn and cold and totally racist. It defeated his Presidency. He just wanted to let the Confederate States back in the Union and go on with life – let them deal with their own issues. Radical Republicans assumed that there would be land distribution and voting rights. Johnson never considered that. He went so far in blocking anything like that he was finally impeached. This is also a very detailed chapter, very complex with an abundance of ideas regarding under what conditions the South should be readmitted – if the North should be involved in Reconstruction. Johnson hated big money of plantations and the blacks, both. He wanted Reconstruction to benefit the small, poor white farmer. So instead of replacing the old “slavocracy” with Union sympathizers, he just put the old powers in top positions – many in the Freedman’s Bureau. But there were Radical Republicans in the Freedman’s Bureau also – there was great tension. Many folks thought that a free market would spring into being but with blacks denied voting and jury rights that was not going to happen. Republican powers in congress got together and hashed out the plan – The Reconstruction Act. The new states had to ratify the 14th amendment (black suffrage) and present a new appropriate constitution. They disenfranchised (temporarily) the Confederate supporters and barred them from holding office. The bill divided the South into military units. It was based on idealism and ultimately failed because blacks were duped by fraud, corruption and violence. Blacks got organized and voted and went to rallies and did what they could. They wanted exactly the same rights and opportunities as the white man. (Not much was said about women but they took part in this.) Carpetbaggers and Scalawags showed up to educate, go into business, go into politics, take part in the opportunities and the change. And guess what? Each of these groups had their sub-groups, with their own ideas, too. Alignments were of convenience as well as of conviction. There were classes and groups of blacks as well as of whites. All sorts of odd bills got passed through new state legislatures. Some questioned black voting at all, others refused to see an alternative to that. And then Johnson was impeached for overstepping his bounds. The Grand administration was going to be more moderate than the Johnson conservatism. The basic thing at the time in the South was getting folks to vote – no matter what you did to get that. The Democrats got more racist and intransigent. The Republicans got more insistent but oddly conservative – keep the way it is now. The Southern Whites were afraid the Southern Republicans would go too far. Chapter 8 – Reconstruction: Political and Economic. This is a really long chapter about the realities of law, labor and free blacks. Every state had blacks or Reconstruction Republicans in office at the highest levels for the first few years of Reconstruction – when blacks were voting en masse. Then blacks got more offices. Some were fine there, others had far less education and experience. This showed in the criminal cases which were prosecuted and won, the breadth of the power the newly elected assumed themselves to have, or were assumed to have.